There's still lots of snow in these parts thanks to a late March dumping of two feet of snow. Keep an eye on the Burke Driftskippers facebook page for snowmobile trail condition updates. Burke Mountain will remain open 7 days a week through April 7th. After that, the mountain will be open on weekends until April 21st (weather permitting, of course). Kingdom Trails will be open for fat-biking and Nordic treks until the melting snow and warm temps take us slippedy sliding into mud season. Our fifth season! There's nothing you can do about it so why not just make the most out of it like those folks signed up for the Rasputitsa Spring Classic. 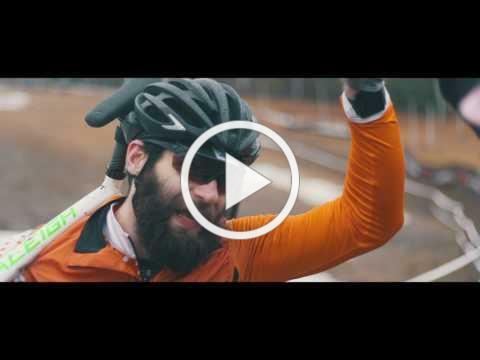 This 40 mile gravel bike race in East Burke offers a crazy ride that is Vermont in Spring with roads that are muddy, crunchy, snowy, slippery, spongy and slushy. The smiles on the muddy faces at the finish line say it all! The Burke Area offers many unique lodging opportunities and lots of ways to accommodate large groups or those on a budget. There's a new place to stay and it was once home to some friendly sheep. Wooly Buggah Barn has been beautifully renovated into a 2 bedroom vacation rental with reclaimed wood and Vermont slate. Primitive field camping is also available on the 80 acre property. Ask about active vacation experiences with on-site private fitness coaching & Jasper Hill cheese tastings! There's room for the whole gang at Burke Property Rentals which offers several rentals in the area that sleep from 7-14 people. These spacious homes include full kitchens and lots of amenities including laundry rooms, gear storage space, fire pits, WiFi and much more! Kingdom Farm Lodge offers a 3 bedroom farmhouse rental as well as a renovated cattle barn with 8 rooms to rent, a common living room area and shared bathroom space. Each room has a unique theme such as the Sugarhouse, Horsestall and, of course, the Milkhouse Room. It's perfect for bikers on a budget with on-site bike wash and repair stations. The Serenity Spa is offering some great mud season deals to get you refreshed for Spring. Enjoy 50% savings on luxury facials until May 15th. Other specials include 3 Swedish massages for $180 or 3 deep tissue massages for $220 (that's 3 for the price of 2!) You can book appointments online and don't forget to sign up for the spa enews and be in the know about spa deals. Beneath all that white stuff is green grass just waiting to bust out. Summer is coming! If you spent a little too much time hibernating and enjoyed a little too much comfort food this winter, it's time to get it together and get in shape. If you need some help with that, there are lots of choices for fitness classes and personal trainers in the area. Trail2Wellness offers a range of classes for beginners to experts including high intensity, endurance, strength training and yoga workouts. XIP Training offers group classes and bootcamps specific for men, women and even kids. Kilos Fitness and Performance is ready to help you achieve your fitness goals whether you're competing in an arena or just competing with yourself. Group and private strength and conditioning classes are offered as well as open gym times. A great way to motivate yourself to get back in shape is by signing up for one of the many fun runs and competitive races that happen in and around Burke, many of which benefit great local causes. May - Rail Trail n' an Ale 5K to benefit Caledonia County Relay for Life. August - Kingdom Run (5K and 10K walk/run, half marathon) to benefit the Northeast Kingdom Spay/Neuter Program. September - Westmore Mountain Challenge (1 day, 5 mountains, 26 miles) benefits NorthWoods Stewardship Center. September - Pond-a-Thon Fun Run (or bike/2.5 or 5 miles) to benefit Brighton Recreation. improve, maintain and build new trails in the area. October - Kingdom Challenge (5K and half marathon) to benefit the Good Shepherd School. Check out Kingdom Games for events throughout the summer including running, biking, swimming and kayaking races. In June, you can sign up for The Moose and challenge yourself to a 103 mile bike ride starting and ending at Mike's Tiki Bar. In August, check out Swim the Kingdom week featuring various length swims in different lakes including Caspian, Island Pond and Lake Willoughby. For those looking to improve skills on the bike, Kingdom Cycling & Experiences is hosting several Mountain Biking Skills Weekends including Queens of the Kingdom and Mountain Bike Sleep Away Camps for kids. Check out our frequently updated events calendar for more listings of upcoming races and clinics.